This entry was posted in Lobbying and tagged CELDF, Colorado River, Community & nature rights, Courts, DGR activity & statements, Deep Green Resistance, Water on September 21, 2017 by DGR Editor. A congressional bill touted as an alternative to the Bears Ears proposal, an intertribal request to designate nearly two million acres of land as a national monument in southeast Utah, is moving forward to the full House of Representatives. The Utah Public Lands Initiative Act, H.R. 5780, sponsored by Rep. Rob Bishop (R-Utah) and co-sponsored by Rep. Jason Chaffetz (R-Utah) passed 21–13 in the Republican-majority House Natural Resources Committee on September 22. Committee Democrats, including ranking member Arizona Rep. Raul Grijalva, expressed several concerns with the bill, saying it did not contain a tribal consultation component or protect half a million acres identified by the tribes in their larger Bears Ears designation request. Grijalva offered an amendment that would remove the Bears Ears National Conservation and the Indian Creek Wilderness areas from the bill. The Public Land Initiative designates about 1.4 million acres of federal land for “conservation and recreation,” according to a media release from the bill’s sponsors, as well as “exchanges and consolidates certain federal and non-federal land; and provides for economic development within the State of Utah.” Opponents say the measure would open the land to natural-resources development and give a fair amount away to unspecified private interests. Committee Republicans rejected a total of six amendments from Democrats, including one by California Rep. Raul Ruiz that would have protected land, water, roads or other resources within the Uintah and Ouray Ute Reservation. Calling H.R. 5780 “legislation that tramples over sovereignty and self-determination” and “a modern-day Indian land grab,” Ruiz said the Ute tribe was denied an opportunity to present their concerns to the committee in a formal hearing and that the bill was fast-tracked to avoid a hearing in the Indian, Insular and Alaska Native Affairs (IIANA) Subcommittee, where Ruiz is a ranking member. Democrats during the hearing continually referred to opposition from area tribes, including the bill’s exclusion of 500,000 acres of the Bears Ears region named after two 9,000-foot twin buttes, an area residents say is sacred and contains more than 100,000 archeological sites. California Republican Tim McClintock said the movement to protect Bears Ears came from outside the Four Corners area, and several tribes in the area have supported the Public Lands Initiative (PLI), including a single elected Navajo official, Republican San Juan County Commissioner Rebecca Benally. Ruiz took issue with the characterization of Benally as a spokesperson for the entire Navajo Nation and reminded McClintock about tribal sovereignty. The Navajo Tribe, Ute Mountain Ute Tribe, the Uintah and Ouray Ute Indian Tribe and the Hopi and Zuñi Pueblos support the monument proposal, and created the Bears Ears Inter-Tribal Coalition last year after failed attempts to work with Utah representatives. The coalition formally asked President Obama to designate 1.9 million acres in the area as a national monument under the 1906 Antiquities Act, which gives the President signing power to create such monuments on federal lands. During a press tour of the region in July, Interior Secretary Sally Jewell said the President plans to make a decision on the issue before the end of his term. The issue has deeply divided the Four Corners community. The day before the House Natural Resources hearing a group of Utah Navajos during a news conference outside the U.S. Capitol opposed the monument, saying a monument designation would interfere with Bears Ears access and their traditional way of life. Six of seven Navajo communities in Utah have passed resolutions supporting a monument. Standing with Utah lawmakers and Gov. Gary Herbert, Navajo resident Susie Philemon made a direct plea to the President, “Please do not take this land from us. Please don’t break more promises not again,” according to the Associated Press. In a video posted on the day of the Natural Resources meeting, Rep. Bishop, who is committee chairman, said the Public Lands Initiative is a compromise after 1,200 meetings, 50 field trips, and public and private hearings. This entry was posted in Colonialism & Conquest, Human Supremacy and tagged Arizona, Bills & laws, Conservation & preserves, Utah, featured on October 9, 2016 by DGR Colorado Plateau. 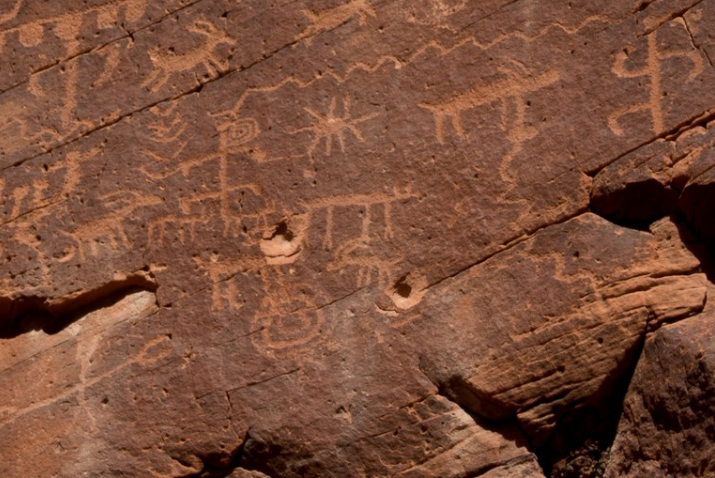 Surveyors found illegal cattle grazing, defaced petroglyphs and ditch-digging. In June 2015, for the first time since federal officers confronted Cliven Bundy and militia members over Bundy’s illegal grazing in 2014, the Bureau of Land Management sent a survey crew to the Gold Butte area near Bunkerville, Nevada. The three surveyors from the Great Basin Institute were there to inventory springs, cattle troughs and seeps. According to contemporary news reports, they encountered Cliven Bundy and his son, Ryan Bundy, who spoke with them briefly and asked what they were doing. Later that night, as the surveyors were getting into their tents, a vehicle lit up the camp with its headlights as it drove by, and shortly afterward, three gunshots rang out nearby. An hour later, they heard three more shots. The surveyors packed up in the dark, left and did not come back. Cliven Bundy told reporters he had not fired the shots, and the BLM kept out of Gold Butte. Bullet holes in petroglyphs. Image by Friends of Gold Butte. Read more about FoGB’s findings here. Since the standoff at Bunkerville, Cliven Bundy’s roughly 1,000 cattle have remained at large. Nor has the rancher paid the more than $1 million he owes in grazing fees and fines. Cliven Bundy hasn’t escaped altogether, though: In February, he was arrested en route to support his sons’ armed occupation of the Malheur Wildlife Refuge in southeastern Oregon. He is now behind bars awaiting trial in 2017. But in other respects, Bundy got what he wanted: His cattle still graze for free on Gold Butte, just as they have done for the past two decades, despite a 1999 ban, and there was little to no federal oversight for two years. This entry was posted in Biodiversity & Habitat Destruction and tagged Bureau of Land Management, Livestock industry, Nevada, featured on October 1, 2016 by DGR Colorado Plateau. 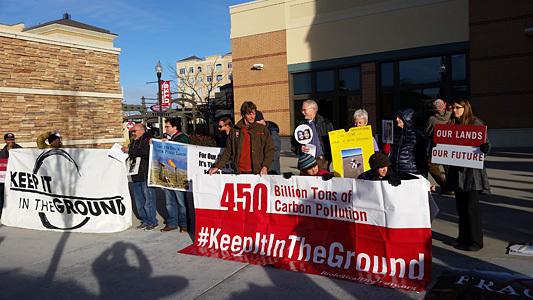 This entry was posted in Movement Building & Support on July 23, 2016 by DGR Colorado Plateau. The Tavaputs Action Council, a regional alliance of grassroots activists, is organizing a direct action gathering from June 17th-19th on the East Tavaputs Plateau. Over these two days we will cultivate resistance, biodiversity, and beauty in a space that has been destroyed by tar sands strip mining. The gathering will celebrate life, water, and resistance on the Colorado Plateau through music, storytelling, and art. Each day we will share the skills and techniques needed to continue building the world we desire: direct action, community organizing, art & creative protest, decolonization, land & water restoration, and permaculture. 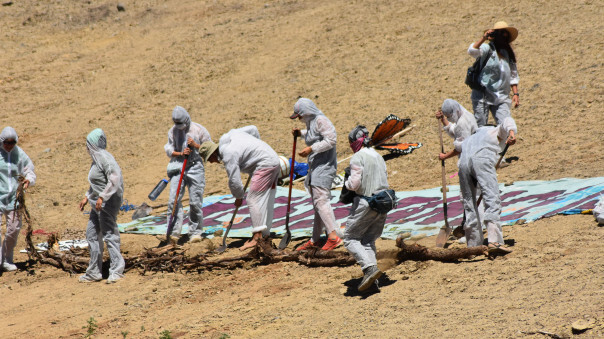 Join us as we fight for an immediate start to PR Springs mine reclamation and an escalation of mine clean up efforts across the Colorado River watershed including tar sands, fracking, uranium, and coal impacted areas. Lace up your boots, bring your shovels, and let’s get to work this June. This entry was posted on May 9, 2016 by DGR Editor. Randall Gaines and Misty McKee were fast asleep early one morning last month when the sound of “obnoxious banging” outside their Wingate Avenue home jolted them awake and out of bed. Before the couple could even get from their bedroom into the hallway to find out what was happening, someone kicked down their front door. Four intruders then rushed toward Gaines and began to beat him violently, according to McKee. As she ran into another room to call 911, the assailants dragged Gaines out of the home. She watched helplessly as they drove off in a truck with her boyfriend, who was severely beaten under captivity until they finally returned and threw him onto the street outside, according to a police report on the incident. Police subsequently arrested Jeffery Dee Tranter, Keith Condie Leavitt, Joshua West Laurio and Gabriel Lorenzo Laurio on suspicion of numerous felony and misdemeanor charges, including first-degree assault, kidnapping and aggravated burglary. All four suspects have since been released from custody after they posted bail, which ranges from $74,000 to $76,000. This entry was posted in Male Violence and tagged Utah on January 17, 2016 by DGR Colorado Plateau.